Home Uncategorized Tap Takeover at Plan Check, Pappy Van Winkle in Pasadena, and More! Tap Takeover at Plan Check, Pappy Van Winkle in Pasadena, and More! Just in time for the super bowl, Salt Lake City’s Epic Brewing Company storms into town to take over the taps at Plan Check on Fairfax. Epic’s Brainless series makes an appearance, as do taps flowing with Big Bad Baptist Imperial Stout and Utah Sage Saison Belgian-Style Ale. Guests receive a free Epic Brewing Company pint glass with each beer purchase. More information. The world’s rarest and most sought after bourbon has arrived in Pasadena. The Blind Donkey will serve 1-ounce shots of their shipment of Pappy Van Winkle (10, 15, 20, and 23 year). Other rare spirits will also be on offer, including Eagle Rare 17 Year, George T. Stagg, Thomas Handy Sazerac Rye, and Stagg Jr. More information. An L.A. icon, La Brea Bakery went under the bread knife last year. It reemerges this month just in time for its 25th Anniversary. Celebrate the shop’s new look and location (a few blocks north—still on La Brea) with Nancy Silverton herself. Samples and a ribbon cutting are the icing on the cake. More information. 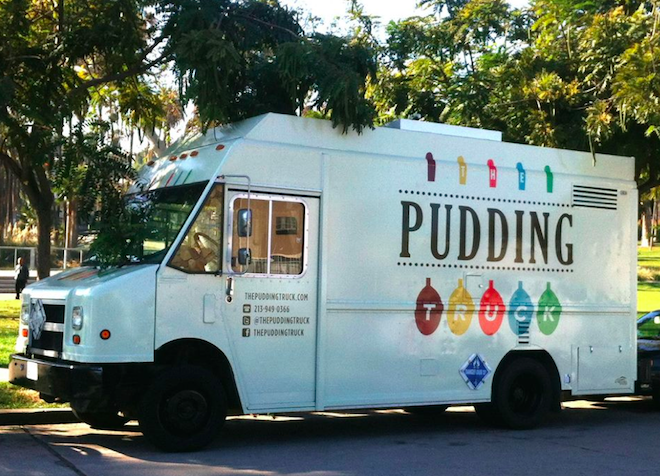 Just when you thought there was a food truck for everything, The Pudding Truck rolls up. Taste free samples of stove-top pudding in flavors like butterscotch, vanilla bean, and vegan chocolate hazelnut when L.A.’s newest dessert truck hits Golden Road Brewery’s beer garden from 7 until 10 p.m. Samples are free; pints are available for purchase. More information.